The photos were taken by a young woman while she focussed on lights on the horizon. The next day, while playing the digicam's zoom, her father ascertained that they were vehicles similar to the Unidentified Flying Objects seen on the Internet. A girl from Tres Arroyos photographed a group of UFOs while she spent a weekend fishing with her family at a a lagoon near Oriente. The sighting took place on Wednesday, October 17. However, her father detected the vehicles in the image the next day, while playing with the zoom on his daughter's camera. Yesterday afternoon, Carlos Fabian Sapag approached La Voz del Pueblo with his wife Marta Daniela Arias and his daughter Carla, 12, to share the images and his experience with our readers. "It took place on October 17 at the Norrild Lagoon, some 30 kilometers from Oriente heading toward Irene, where the police officers had their experience on Wednesday," Carlos recalled as he thought back to an episode that he is certain he will never again see in his life. "We were fishing, stopped doing it, and started to boil water while the girl took photos of the horizon. She likes photography a lot and snaps the shutter at everything that moves," explained her dad, whose own experience took place the next day, when he reviewed the images taken by Carla. 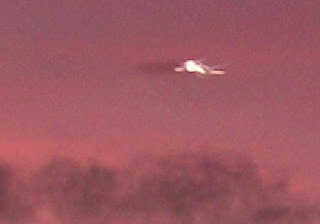 "The next day, toying with the camera's zoom, we saw there was an airplane in one of the photos. In the measure that I enlarged it, I saw a bunch of little things that were unknown to me. We checked on the Internet and were able to see that they were all lights of the same kind." Their curiosity ended there. Several days went by without the photo being deleted from the camera's memory until a family friend suggested that they share the image with the press. "We decided to approach the press at a friend's recommendation. Besides, we didn't want this to end up in limbo," he remarked. Displaying the detail of his images on a computer, Sapag discussed what he felt after the experience. "I don't know what I would do if I experienced something like [what happened] to these policemen. I can't imagine. I believe in life in other planets, since there's life here, there must be life elsewhere." He also stated that he had informed himself about the presence of UFOs in the region. "All of the UFOs seen around here appear in bodies of water like lagoons, such as the one at Sierras de los Padres in Mar del Plata. That's where they're usually seen." Meanwhile, his daughter Carla, who took the images, acknowledged having done it by sheer chance and that when she did so, she did not pick up any noises or strange odors, unlike what was described by the police officers from the Oriente station. "I didn't see anything moving. I took [the photo] because I like the combination of colors, and I like photography," she said. Before saying farewell, Carlos referred to the way that this experience will influence his life. "I didn't feel like fishing again. I felt fear and the sensation that something's watching one. Yesterday (Sunday) I was going to go, but changed my mind in the end." The sighting reported by the Sapag Family to thes newspaper took place 4 weeks before the contact experience reported by the police officers from the Aparicio station. The difference with this latter case consists in the chance to see the occupants of the strange vessels."